EuAbout is a young organization (www.eu-about.eu) based in Brussels. EuAbout is specialized on services of general interests such as energy, transport, water, waste and education (mainly on Vocational Education and Training (VET)). EuAbout is specialised in monitoring and evaluating policies and programmes through evidence-based methodologies, approaches and tools. The main idea is to combine human, social cohesion, environment and economic sustainability. Therefore, climate change, circular economy, social labour inclusion of disadvantaged people (migrants, refugees, disabled, women victim of traffic or violence, etc.) are topics/targets under the lens of the organization. EuAbout is searching trainees with strong background or motivation on the aforementioned topics for the next 12 months starting from November 2017. The Business Confidence Survey 2017 (published on 31/05/2017) brings together the input of over 500 senior representatives of the European Chamber’s member companies to provide an annual overview of their performance and outlook from within the Chinese market. Revenues and earnings before interest and taxes improved, without any marked increase in optimism about the long-term business outlook. The top regulatory barriers faced by European business remain the same, and there is a lack of confidence that this situation will improve over the next five years. European companies are positive about President Xi’s anti-corruption campaign and the incremental improvements to China’s IPR protection regime. There is a disproportionate enforcement of environmental legislation against foreign-invested enterprises compared to state-owned enterprises and Chinese privately-owned enterprises. European companies report increased competition from Chinese privately-owned companies as the latter's capacity for innovation increases. The EU-China Comprehensive Agreement on Investment must be completed to give European business the confidence it needs to ramp up investment in China. Please click here to view English press release and here for the full report. Minimum wages increased in most EU countries last year in an effort to redress social dumping, a new research has found. According to a new report, published by Eurofound, the European Foundation for the improvement of living and working conditions, there was a boost in the level of minimum wages in 2016. For a long while the idea of a European minimum wage was something that took the backseat in EU policy. Now it is taking centre stage. To combat inequality and poverty, the European Commission has pushed all member states to introduce minimum wages for their workers. “There should be a minimum salary in each country of the European Union,” Jean-Claude Juncker told a conference on social rights in Brussels last month, adding that those seeking work should also have a guaranteed minimum level of income. However, out of the 28 member states, just 22 use the scheme. In Austria, Denmark, Finland, Italy and Sweden, the level of the minimum wage is set in sectoral collective agreements. Within the last year, the increase in minimum wages accelerated, with the largest gains in the newer EU member states. Despite general convergence between the 22 EU countries using the scheme the differences remain stark, according to Eurofound. A worker on the minimum wage earns €1,999 per month in Luxembourg, compared to just €235 in Bulgaria. Romania, Hungary and the Czech Republic recorded the highest increases, continuing a seven year trend of consistent growth in these countries, albeit starting from very low levels. The benefits of a return to economic growth are clear for low-wage workers in most member states, and only Greece recorded a lower minimum wage in 2017 than 2010. Also other factors such as living standards and costs vary across the EU, as do levels of unemployment. Juncker explained last month that a European minimum wage is important in the fight against social dumping. Social dumping involves undercutting a country’s social system to reduce the cost of labour. In many instances this means moving production to lower wage countries, but can also involve employing posted workers under the conditions of their home country or migrants who are prepared to work for lower salaries. MEPs warmed to the idea of a minimum wage pegged at 60% of the median income in a resolution on social dumping last year. There is a trend towards a gradual merging of minimum wage levels in Europe. Recently there has been a return to more collaboration in determining minimum wages in a number of member states with the input of socials partners and expert committees. Yet, there is still a long way to go. Although the Commission has restricted control over social policy, it is ready to confront social and economic injustices across the 28 nation bloc. The executive will present its reform proposals in the coming weeks, before a summit in Rome on 25 March to celebrate the 60th anniversary of the Treaty of Rome, which laid the foundations of today’s European Union. With China announcing a plan to eventually end the production and sale of vehicles powered entirely by fossil fuels, domestic and foreign-owned automakers are expected to be even more aggressive in developing electric and alternative vehicles for the world's largest car market. The Xinhua news agency on Sept 9 cited China's vice-minister of industry as saying that China is studying when to ban the production and sale of cars that use only traditional fuels. Xin Guobin didn't release a specific date when such a ban would occur, Xinhua reported. In April, General Motors Co said it would launch 10 electric and gasoline-electric hybrid vehicles in China by 2020. Last month, GM introduced the two-seat E100 comes from GM's Chinese joint-venture brand, Baojun, and costs around $5,300. It has a range of 96 miles per charge and a top speed of 62 mph. Other auto producers like Tesla Inc, Volkswagen AG, Honda and Nissan Motor Co also have announced aggressive plans to make and sell electric vehicles in China. Among domestic manufacturers, Warren Buffett-backed BYD led in sales in the first seven months of this year, delivering 46,855 electric and plug-in hybrid vehicles, according to the China Passenger Car Association. "Chinese authorities are looking to fast track new energy vehicle (NEV) sales, but despite subsidies the growth in volume in the NEV segment amounts to just around 1.8 percent of the total vehicle market in China so far this year. The authorities are beginning to look for tougher and more stringent ways to strengthen the NEV segment," wrote Namrita Chow, principal automotive analyst of IHS Markit in an email. Noting the lack of a specific timetable for the elimination of fossil-fuel powered vehicles, Chow said "at this point in time it is just rhetoric regarding the complete ban of (internal combustion engine) vehicles in China, there is no time line and no policy implying this is at all imminent." Arthur Wheaton, an automotive expert with Cornell University's School of Industrial and Labor Relations, said that because the Chinese auto market is the largest in the world, all global auto companies will attempt to meet whatever policies are in place to continue in the market. 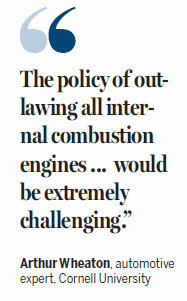 "The policy of outlawing all internal combustion engines for sale in China would be extremely challenging," he said in an email. SAIC, BAIC, Geely, Changan are among the Chinese auto companies that could capitalize if the ban is implemented said Wheaton. Those companies and others have significant partnerships with global manufacturers and their joint-ventures would be crucial to ramping up capacity to meet the needs, he added. Wheaton doesn't anticipate a ban happening soon. "I am pessimistic this policy will be implemented fully for decades. I think the phasing in of increasing (the) number of electric vehicles is more likely and the slower pace would help Chinese auto makers build expertise to meet the demand gradually with help from their joint-venture partners," said Wheaton. Britain’s exit from the EU could slow down Europe’s economic growth. However, unemployment forecasts remain positive. The latest Eurostat figures show that the number of jobless has been steadily declining. Towards a more responsible lifestyle for European students?